Beef marinade: 2 Tbs soy sauce, 1 Tbs sugar, 1 Tbs sesame oil, 1 crushed garlic clove and 2 tsp toasted crushed sesame seeds. 4 oz Shiitake mushroom, discarded stems,sliced caps( or 4-5 Chinese dried mushroom, wood ear mushroom) soaked 30 minutes in warm water. 2 green onions, cut into diagonal thin slices, save 2 white part for decorations. 1Tbs vegetable oil and extra for frying egg. Heat 1 tsp oil in a small non stick pan over medium high, beat egg yolk together and pour into the pan, stilt the pan make a thin layer. When set, slide them on to a plate. Cook egg white in the same way. Cut both yolk and whites in diamond shapes or thinly threads and set aside. If use dried mushroom, drain, squeeze all water out, cut and discard the stems, slice the caps. Blanch spinach in boiling water until wilt, drain in cool water, squeeze out all the water too. Drain the beef. Heat 1 Tbs oil in a large pan and stir fry the beef, until it changes the color, add garlic and shallot, stir fry briefly until fragrant. Add carrot and onion, stir fry for 2 mins, then add the other vegetables, toss them well, when they look wilt but still crunchy, add noodles and seasoning with stir-fried sauce, about 4-5 Tbs should be enough. Cook for another minutes, add 1/2green onion slices, toss well. Spoon into serving dishes and garnish with eggs, remaining green onion, sesame seeds. Serve warm or slightly cooler than room temperature. This recipe yields 4 dishes similar to the pictures. 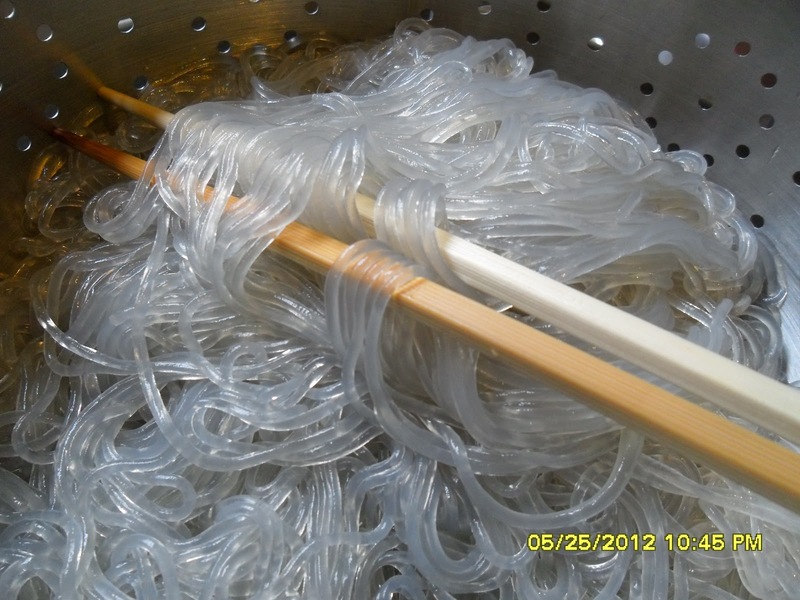 *Notes: these noodles have a transparent look after cooking that is different from rice noodles have white color. The raw looks of different noodles. The upper left corner is large size sweet potato noodles or cellophane noodles (use in this recipe). At center and right lower corner are rice noodles (rice vermicelli). 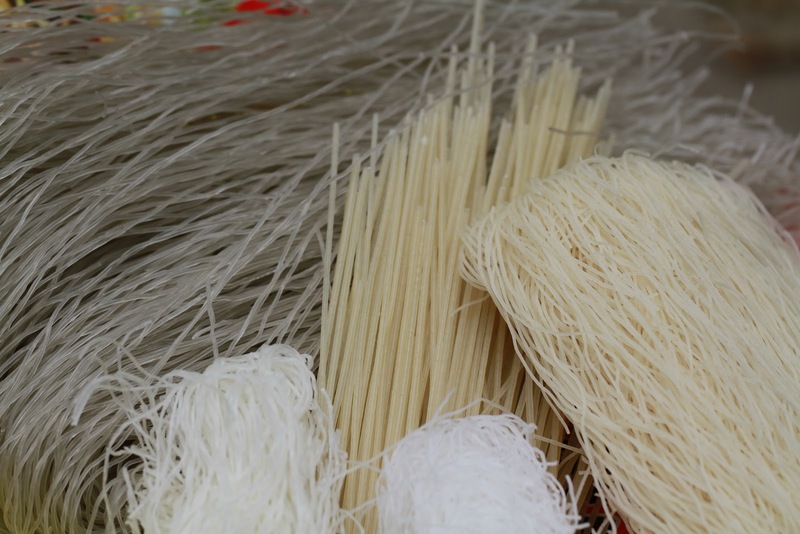 At the bottoms, small size mung bean noodles which also called cellophane noodle use in stuffing, egg roll, egg cake, etc.